The Oregon Legislature opens this Feb 1st awash in taxpayer cash and riding a 35 year wave of double digit budget increases. Oregon state government has been growing faster than population and inflation combined for those 35 years. That means Oregon taxpayers have been over-taxed and politicians have been over-spending for as long as many Oregonians have been alive. Double digit increases are not enough as politicians like Governor Kate Brown have already proposed a billion dollar in tax increases. That’s a billion dollars on top of the already billion dollars in surplus tax revenue that is coming in from growing tax revenues. – By comparison, Oregon state and local government spend more per person than 39 other states. So Oregon has more than other states and spends more than inflation and population combined and still Gov. Brown demands more taxes. 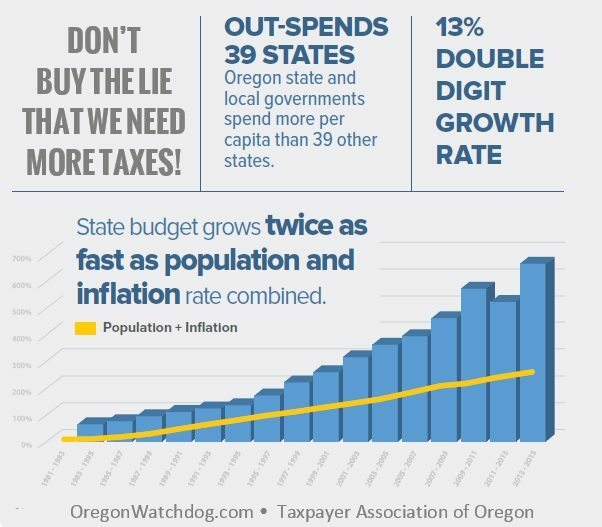 — Please email, Facebook and Tweet this article to alert and inform all Oregon taxpayers.